The Christian church has a complete system of ceremonies, texts, words, periods, paramenta (ecclesiastical vestments and decorative hangings for the altar, pulpit and liturgical accessories) and colours, all of which determine the annual cycle of the religious life of the clergy, and provide both form and content for the faithful. Through the rhythm and sanctification of time, the church wishes to bring the lives of its members, as individuals, nearer to the principle of eternal life. The liturgical year follows the drama of Incarnation — the story of Christ on earth from Advent to Pentecost. The church thus combines Christ’s feast days with those of the Saints featuring in the Catholic cycle in the great liturgical calendar of Christ. The main feast days of the religious year are: Christmas, Easter, the Ascension, Pentecost and All Saints. According to the Mediaeval allocation of time, the following periods are considered Holy: the four seasons; the months of the year (to each of which is dedicated a figure from the life of Christ, a part of Christ’s body, or remembrance of the dead): the days of the week (Sunday being a special day dedicated to God, and special devotions being dedicated to all the other days) and the hours of the day, with recitation of the breviary or attendance of a service. White is the colour of purity and innocence and is worn on the feast days of Our Lord, the Holy Virgin Mary, the angels and the saints who are not martyrs. Red symbolises fire and blood, and is the colour of martyrdom, the Holy Ghost, the Crucifix and the apostles. Although never worn for extended periods, the colour red is seen throughout the year, and denotes individual feast days. Green represents life. It is present on ordinary Sundays, and after Epiphany and Easter. Violet is the symbol of quietness and penitence. Violet is worn on the Sundays and weekdays of Advent, during Lent, on feast days at the beginning of each season, before a period of fasting and on pilgrimages. Black is the colour of mourning worn on Good Friday, on All Saints’ Day and at masses for the dead. Pink marks the pauses for joy during periods of penitence and fasting. Gold is permitted on holidays and can replace white, red and green but never black. The colours used in the Catholic church are shown around the outer ring of the large illustration, within which the most important feast days on the religious calendar are also shown. The innermost circle provides a summary and states the predominant colours for each respective period: Advent as a time of penitence and expectation is placed within the dark shade of violet. White, the colour of the angels, is predominant at Christmas. (The three Christmas masses are characterised by a series of colours so constructed that they lead from the dark, dull colours to the radiant colours of light, for example along the series: violet — red — white.) During epiphany, white, red or gold symbolise the brilliance of the star which guides the three kings, but neutral green then becomes dominant. For the period between Septuagesima and Easter, violet — representing the periods of penitence and fasting — once again dominates. Easter is mostly held in white, while green marks the remainder of the year, until the cycle commences anew. The Directorium, in which the rules governing colours are listed, does not select colours for entirely symbolic reasons, but often places them together randomly, or presents a choice of several colours. 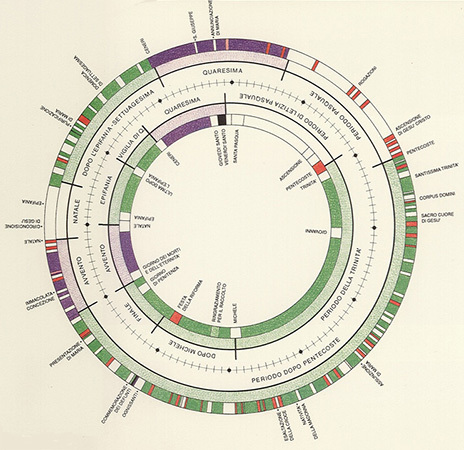 The inner ring conforms to the same system as the outer, and explains the colours of the liturgical periods in the Protestant church’s calendar. (Here, a Protestant community from Milan has been used as an example, but there are certainly variations to the colour-orders relating to Lutheran, Calvinist or Zwinglian ideas, for example). The use of colours in the liturgy of the various Protestant and Reformed Churches is generally far more restrained than in the Catholic church, and can be entirely absent. After the reforms of the 19th century, it was agreed that the old order of liturgical colours would indeed continue to be used, although the utmost restraint was recommended, with «ornate and exalted» colours being dispensed with completely. White retained its symbolic value and was associated with black. Originally, both clergy and congregation wore these two colours, but they were not used in the decoration of the church. White was also used in church services as the colour of mourning in order to illustrate the close relationship between death and reincarnation. 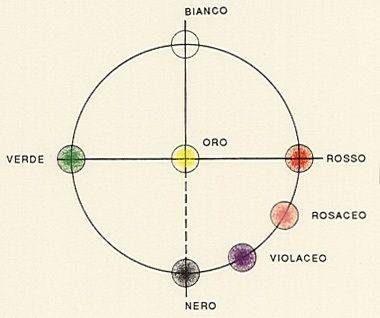 If the colour system pertaining to the Catholic tradition is compared with that of Protestant churches, it is apparent that the Catholic system appears more sensual, while the Protestant system is marked by a more logical use of colours. The colours in the second illustration are arranged around the traditional colour-circle, with gold at its centre. Two polarities thus arise: red/green and white/black, with the other colours concentrated in the area between red and black. The third illustration shows the liturgical feast days as related to the astronomical calendar, and also the solstices and the equinoxes which, in the rural — generally speaking pre-Christian-world, are of great significance. 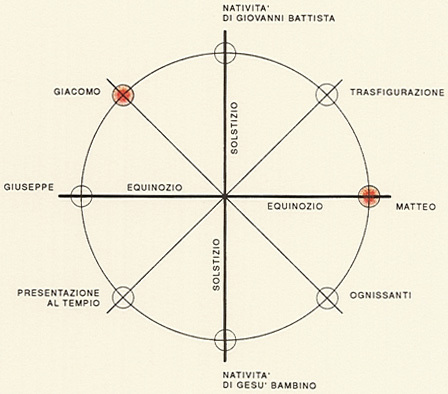 Here, the extent is evident to which the liturgical calendar «inverts» the astronomical calendar by connecting the two solstices and the two equinoxes with other religious feasts. The four quadrants thus arising are in turn divided by other feasts, arranged as symmetrical opposites. The predominant colour of these feasts is white, and only Jacob and Matthew are entitled to red. Bibliography: K. Goldhammer, «Farbe, liturgisch», in Reallexikon zur Deutschen Kunstgeschichte, published by the Zentralinstitut für Kunstgeschichte München, Volume VII, Munich 1981.